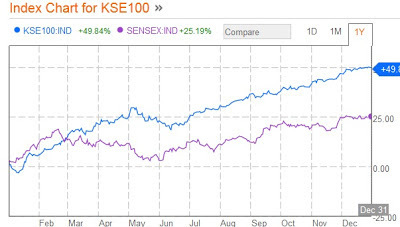 Karachi's KSE-100 index surged nearly 50% (37% in US $ terms) in 2012 to top all Asian market indices. It was followed by Bangkok's SET index which advanced 36%. It also easily beat India's Sensex index which was the top performer among BRICs with 25.19% annual gain. A string of strong earnings announcements by Karachi Stock Exchange listed companies and the Central Bank's rate cuts helped the KSE-100 index approach 17,000 level, a gain of 49.84% (37% in US dollar terms). In spite of this run-up in KSE-100, Andrew Brudenell, manager of the HSBC Frontier Markets fund (HSFAX) in London, remains bullish on Pakistani equities, according to Barron's. Pakistan is one of the cheapest markets he follows, at about seven times earnings. He notes that earnings growth has kept pace with the market. The firms, he adds, are typically cash-rich, boast strong return on equity levels in the 20% range, and pay good dividends.